Quest Cod Liver Oil provides Omega 3 fatty acids and is a rich natural source of vitamins A and D, essential fat soluble vitamins that are required for healthy vision, immunity and bone metabolism respectively. May help support joint health. 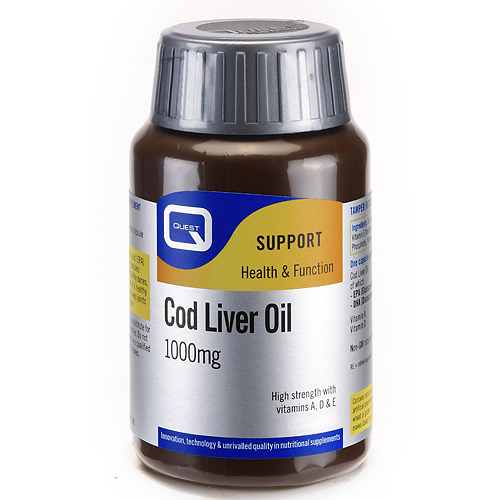 Why use Quest Cod Liver Oil? Cod Liver Oil, Capsule Shell (Gelatin, Glycerin), Vitamin E (Natural source Vitamin E from Non-GM Soya), Vitamin A (with Antioxidant: Tocopherols, Tri-Calcium Phosphate), Vitamin D3 (with Arabic Gum, Tri-Calcium Phosphate, D-alpha Tocopherol). Take one capsule daily with food. Swallow with water. Not recommended if you are pregnant, likely to become pregnant or breastfeeding due to the Vitamin A content. 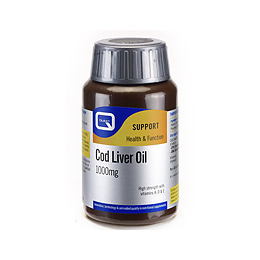 Below are reviews of Cod Liver Oil 1000mg Omega 3 Fatty Acids - 30 Capsules by bodykind customers. If you have tried this product we'd love to hear what you think so please leave a review.